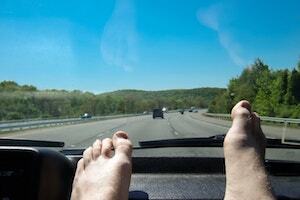 You have probably seen this while driving on the highway – a passenger in another vehicle with their bare feet or knees resting on the dashboard. You may even be guilty of this yourself. But did you know that propping your legs up on a vehicle's dashboard could cause serious catastrophic injury and even death? A recent minor accident in Georgia reminds all of us to keep our feet planted on the floor of the vehicle and to wear your seatbelt. Airbags can deploy in 1/20th of a second at between 100 and 220 miles per hour, according to the National Highway Traffic Safety Administration (NHTSA). That leaves no time for a person to react in the event of a sudden collision. Many of these injuries could be life altering. An airbag at that speed could easily send your knees into your face causing eye damage, a broken jaw, lost teeth, a broken nose, a brain injury, a broken leg, a spinal injury, and even death. NHTSA states that because air bags deploy very rapidly, serious or sometimes fatal injuries can occur if the occupant is too close to – or is in direct contact with – the air bag when it first begins to deploy. NTHSA recommends sitting as far back from the steering wheel or dashboard as possible and using seat belts help prevent occupants from being "too close" to a deploying frontal air bag. The Insurance Institute for Highway Safety (IIHS) says that vehicles provide optimal protection when occupants are belted and sitting in the proper position. Drivers and front-seat passengers should sit in the center of the seat upright against the seatback with feet on the floor. Arms and legs should never be resting against an airbag because the forces of a deploying airbag and the hot gases exhausted by the airbag may cause injury. When you put your feet on the dashboard, and if you have a seatbelt on, it changes the position of the seat belt, and that can cause you to slide forward and into the footwell upon impact, causing serious injury. So how does one avoid this situation – be properly seated, keep your feet on the floor and buckle your seatbelt.